For exercise I alternate walking and swimming, and today was a walking day. 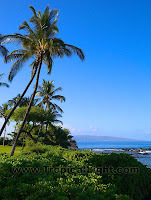 A good part of my route is along the shore in Wailea and I watched three different groups of whales just off shore. One group swam out, one swam north and the other group followed me home. I wanted so badly to swim with them, but without goggles it wasn't going to happen. After an exhausting walk I like to take a dip in the ocean, and there they were, although quite a way off shore. Calling to me, "Don, come swim with us." But again, no goggles. Hopefully they will come back to play tomorrow for my swim day.